Accessorize the living space in your home with the Latitudes Chairside Table. It has a fresh look paired with handy conveniences, designed to make any space unique. 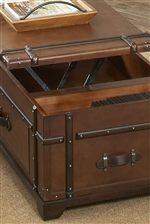 This piece is crafted from Poplar hardwood solid and Birch veneer with synthetic leather-covered engineered wood and synthetic leather accents to give it an old suitcase-like appearance. Plentiful storage and decor display options are provided, including one drawer on ballbearing extension guides and a fixed bottom shelf. Finished in an aged cognac with warm brown tones, the Latitudes Chairside Table is lovely piece to outfit your living room. The Latitudes 1 Drawer Chairside Table with 1 Shelf by Riverside Furniture at Janeen's Furniture Gallery in the Visalia, Tulare, Hanford, Porterville, Exeter area. Product availability may vary. Contact us for the most current availability on this product. Finish & Paint Options You'll appreciate the multiple-step application of Riverside's furniture finishes. Finishing processes involve several steps of hand sanding, applications of several types of finishing coats, padding and polishing. Drawer / Shelf Construction It's the cabinetmaker's choice for making drawer joints that won't pull apart over the years: Riverside featurea craftsmen dovetail joints both in the front and the back of the drawer. The Latitudes Collection is a uniquely designed grouping that will be perfect in your home. It has a fresh, creative look designed to make your living and office spaces visually appealing and storage-savvy. Each piece is crafted from Poplar hardwood solid and Birch veneer with synthetic leather-covered engineered wood and synthetic leather accents to give it an old suitcase-like appearance. 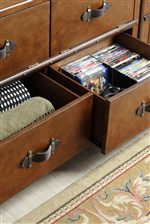 Plentiful storage options are provided, including drawers with ballbearing extension guides as well as shelving. Finished in an aged cognac with warm brown tones, the Latitudes Sofa Table is lovely piece to outfit your living room. The Latitudes collection is a great option if you are looking for Casual furniture in the Visalia, Tulare, Hanford, Porterville, Exeter area. Browse other items in the Latitudes collection from Janeen's Furniture Gallery in the Visalia, Tulare, Hanford, Porterville, Exeter area.